Originally opened in 2013, Baxter's Cigars quickly became a neighborhood business catering to a diverse clientele—later regarded as "Baxter's Family". Baxter's Cigars created a unique place for people to gather and bond. People from all walks of life and economic backgrounds came in to Baxter's to discuss the day's accomplishments, issues of the day, cigar recommendations and generally enjoy the company of strangers, who in the end became friends. What the money is being raised for? The relocation and rebuilding/remodeling of the Baxter's Cigar store. - Construction costs for framing, drywall, electrical, plumbing, and essential building costs. - Painting, facade signage, and security. How soon will we need the funds? The funds we are gathering need to be received by February 28th, 2017 for a reopening in early March, 2017. Why this means so much to Baxter's Cigars? Since Baxter's closing in early 2016, customers had lost the place that meant so much to many. Not even the other stores in Phoenix could satisfy the family that was created by it's owner, Joseph Barnett. There was a hole left in the collective heart of it's regular customers. Many kept in-touch and urged Joseph to find a new location as soon as possible so the family could be whole once more. In October of 2016, after nearly a year of searching and a couple failed attempts to acquire a new space, a building had finally been found. It will need some work to get it where it needs to be. With your help, we hope to realize this dream and give back to our local community. One-time offer of a Baxter’s Life Time Private Membership and 25% off for life with $1000 of retail credit and a lifetime locker. Private memberships to Baxter’s 24hr access lounge, including15% off all purchases for the year and $1,000.00 of retained locker credit for one (1) year. 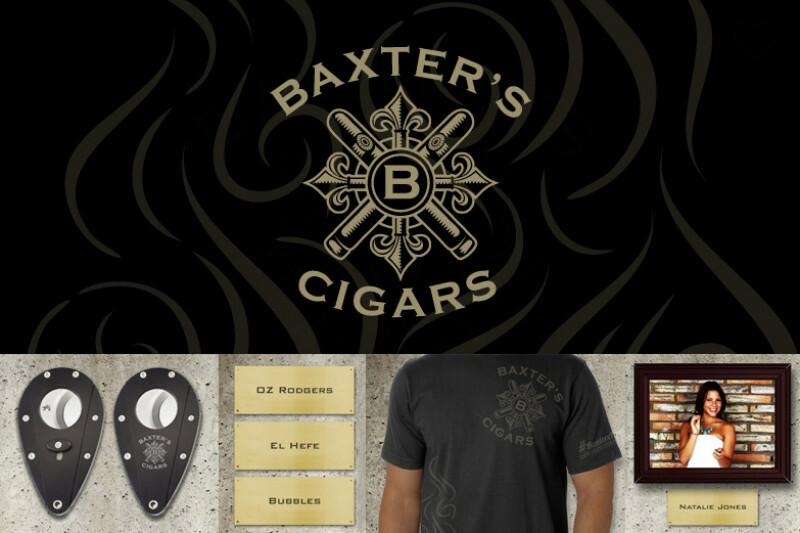 Donors will receive a Baxter’s limited edition support t-shirt & framed donor photo to be placed on the wall of support for life of Baxter’s Cigars. A framed picture of the donor with name plate will be placed on the wall of support for life of Baxter’s Cigars. A 1”x3” placket, engraved with your name will be placed on the wall, showing your support for the life of Baxter’s Cigars. Baxter’s Life Time Private Membership One-time offer of a Life Time Private Membership and 25% off for life with $1000 of retail credit and a lifetime locker. Private memberships to Baxter’s 24hr access lounge, including15% off all purchases for the year and $1,000 of retained locker credit for one (1) year. Private lockers with access during business hours of 10am to 9pm for one (1) year, 15%off of purchases for the year and $250 of retail credit. Limited Edition Custom Baxter’s Xikar Cigar Cutter. Baxter’s limited edition support t-shirt & framed donor photo. Baxter’s limited edition support t-shirt. Wall of Support Placket. Donor name plate will be placed on the wall of support for life of Baxter’s Cigars. Happy Birthday and good luck with the renovations! I'm betting you can pull this thing off. Good luck, Joe. Super excited for the new blood of the cigar industry & how incredibly cool Baxter Cigars looks to be; hope to have a chance to have a cigar at Baxter's sometime soon!